Five years ago, I never thought I would say this but I am really going to miss Boris Johnson. Five years ago, Boris's strategy was to get London moving by 'smoothing traffic flow'. This was an awful, awful strategy that involved removing pedestrian crossings. It meant that Blackfriars got redesigned for cars and only for cars, even though the vast majority of people used that junction on foot. The pedestrian crossings over Blackfriars Road (north of the bridge) got ripped out, for example. In other words, it was bad for everyone who wasn't in a car, not just for cyclists. What's more, although it's hard to prove for definite, my own feeling is that 'smoothing traffic flow' was a direct contributor in worsening collisions and increasing casualties on London's roads. Oh, and what's more, it didn't seem to do anything to improve congestion. You have to remember that all sorts of things impact congestion - like the fact that London's population is booming, like the fact there are thousands more private hire cars and white vans on the road each and every month. And that is why the 'smoothing traffic flow' strategy was conclusively buried by Boris a few weeks ago. 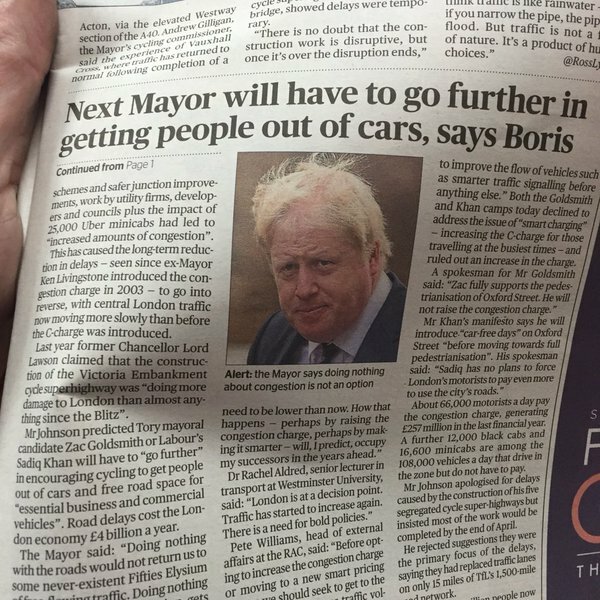 The Evening Standard carried a headline page with Boris saying that the next Mayor would have to extend the congestion charge. Why? Because the only way to make London's streets work efficiently is to get people out of their cars. Boris says exactly that to the Standard. 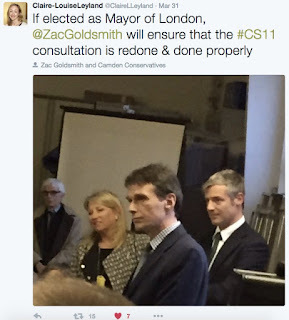 Both Zac and now Sadiq have promised NOT to extend the congestion charge. As many of you know, Zac Goldsmith has been giving slightly mixed messages about all of this, though. In particular, he has been giving mixed messages about cycling. It seems to me he has been telling his audience what they want to hear - on the one hand more cycle highways, on the other going out of his way to attend anti cycle highway meetings. But this latest comment from Sadiq Khan just blows my mind. Speaking to Nick Ferrari of LBC at a hustings, Khan says three things that are just mind-bogglingly awful. 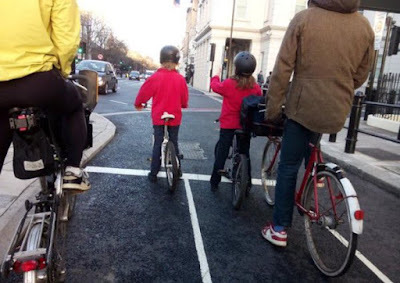 "We've got to learn the lessons from the huge problems caused by the first generation of cycle highways". 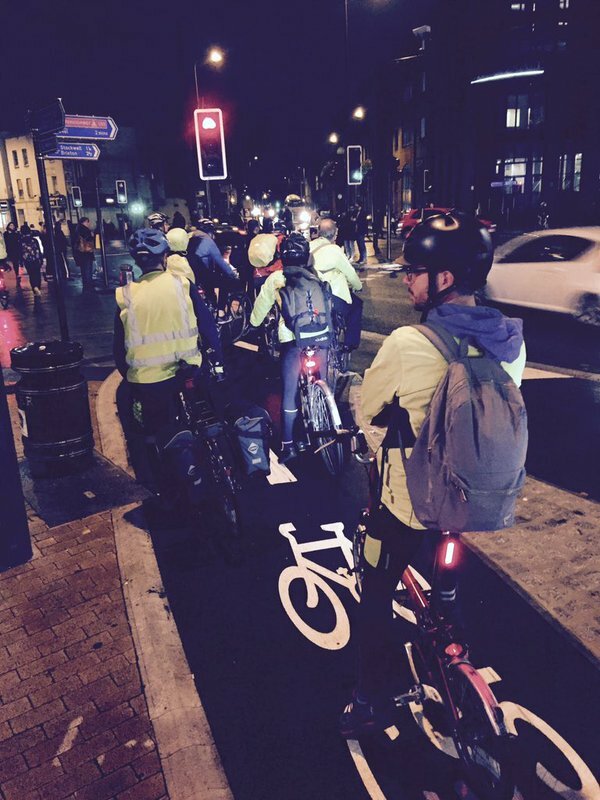 Which first generation of cycle highways? The first generation was just paint, complete waste of money paint. road works are going to cause problems". Nick's right. Building cycle highways = congestion. Once they're built, as at Vauxhall, the congestion goes away, the number of people goes up. But then Sadiq Khan makes it even worse. "You don't have to have [cycle] lanes as wide as we do" - Seriously? Wide cycle lanes? They're only just starting to be built close to international best standards. "You don't need to have permanent obstructions in the road" - So that means no more segregated safe space for cycling on main roads or at junctions does it? Which is odd because Sadiq Khan's manifesto promises more segregated cycle highways and safer junctions. "We have to learn the lessons to make sure cars flow smoother" - This is the most pernicious one. It really depends what Sadiq Khan means here. 'Smoothing traffic flow' hasn't worked in London. 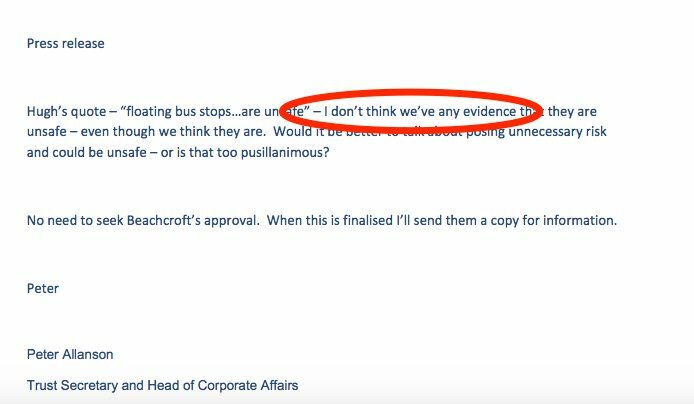 It is an awful policy that some people within TfL still cling to but which simply doesn't work. As Boris Johnson says, we need a Mayor who has the guts to get people out of their cars. Both Khan and Goldsmith seem to be ducking this fundamental truth. Caroline Pidgeon (LibDems) and Sian Berry (Green) are the only candidates talking sense on this stuff at the moment. A fuller review of what they have to same is coming up. Meanwhile, here's the new Blackfriars Road cycle highway in action. It's not even fully open yet. Narrower lanes here? We don't need segregated, permanent safe space for cycling here? It should all be about smoothing flow for cars here? I think not. Zac Goldsmith finally commits: "I will build more segregated cycle lanes" but then says only if the community fully supports it - I'm worried that he's failing to say what he really thinks and that by trying to be nice to everyone he will end up setting communities against each other. Central London - cycle highway on Saturday. Under threat? I've spent a bit of time on this blog recently trying to get my head around Zac Goldsmith's thoughts on cycling. I admit, I haven't given as much time to Sadiq Khan. The reason for that is that, on paper, the two candidates have very similar policies. Goldsmith promises to "continue to support the Cycle Superhighways and the Quietways programme". Khan promises to "Continue the Cycle Superhighway Programme...and prioritise Quietways". 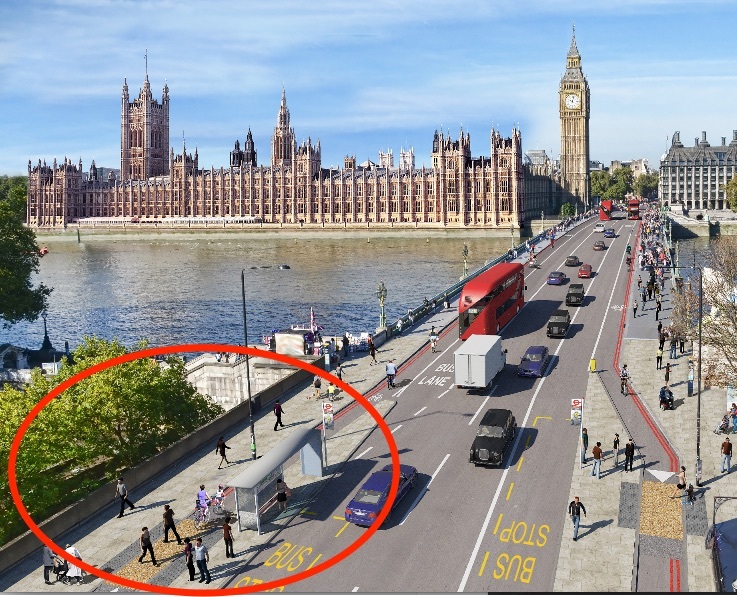 Both, however, hint that there's something they don't like about the Cycle Superhighways. 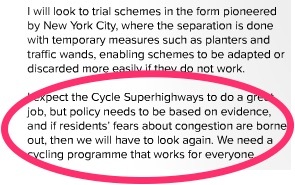 Khan says London must "learn the lessons from earlier [cycle superhighway] schemes", which seems to suggest he thinks something's not quite right, but he at least acknowledges in his manifesto that he will "focus on segregated provision". Goldsmith does say in one article on Essential Surrey's website that "I will build more segregated lanes on London's roads". But there is no commitment in his manifesto to do that. In fact, Goldsmith's manifesto says nothing about segregated cycle tracks at all. In fact, what Goldsmith's manifesto actually says is just downright strange, in my view. His manifesto is packed with rock-hard commitment to things like a new Silvertown road tunnel or to pedestrianising Oxford Street. But when it comes to cycling? Oh no, no such commitment. What he says instead is that he will only support cycle highways if they have "community consent". So, on the one hand, Goldsmith is happy to bulldoze massive chunks of south east London for the Silvertown road tunnel, something which all but one local authority opposes and will blight residents with more traffic in those areas for ever. On the other, a cycle highway? Oh no, can't have that if people think it might not 'work for everyone'. While on paper, then, both candidates initially look quite similar, the differences really start to emerge when you look at the detail. Perhaps, of course, because there isn't much detail from Khan. What is odd, though, is that Goldsmith seems to keep seeking out ways to make his messaging on cycling worse. He attended a meeting on Thursday last week specifically to discuss the plans for Cycle Superhighway 11 through Regents Park. I'd argue this is an extremely local issue. And here's the possible future Mayor of London deliberately sticking his neck out to talk to local voters about a cycle highway. What he promised during that meeting is that, if elected, he "will require TfL to adapt their plans to the community, in such a way that they meet the overwhelming support of the community" and he will re-run the consultation on cycle superhighway 11. That consultation, by the way, had over 6,000 responses, of which 2/3 supported the cycle superhighway. I think there are two problems with Goldsmith's approach. Firstly, when is a consultation not a consultation? By promising to re-run the consultation, he gives the impression that he's the sort of person who will keep re-running consultations until he gets what he wants. Not great. There's clearly a large community of people who support the cycle highway plans and some vocal locals who don't. Which community has the most 'rights' here? Only the people who live on these particular streets, or the people who make use of them? Secondly, I think it is impossible to design transport infrastructure solely by local community approval. It just doesn't work. 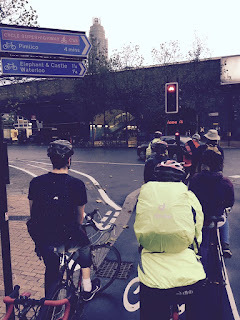 At Vauxhall, for example, a handful of residents were very forceful about opposing the cycle highway. If Mayor Zac was in power, would that have meant no safe cycling through Vauxhall? That cycle highway has only been in place for a few months. We know now from TfL that there has been a 73% increase in cycle journeys as a result. And we also know that motor traffic is back to normal. Are we saying that, under a Zac mayorlty, the support of a handful of residents would be more important to him than creating the safe cycle infrastructure through Vauxhall? The result of this sort of flip-flopping, is that people who are watching Zac Goldsmith are getting more and more shrill in their opinions. On the one hand, some local residents are talking on twitter about waging a 'war' against cycle highways. On the other, it's quite easy for cycling campaigners to really rage against Goldsmith about all of this (and many are). The noises being made on both sides are getting increasingly ugly. I think, in large part, because Goldsmith is trying to please everyone on the way and giving both 'sides' fuel to their fire. I'm trying to give the man a fair reading but his approach feels really unhealthy. I think it shows poor judgment and poor leadership. And that's very worrying for a potential Mayor. Do people think I'm being reasonable and reading this right? Zac Goldsmith published his cycling manifesto today. Cycling should be a vote winner for him but he's really failing to impress so far. Earlier this evening, Zac Goldsmith told a crowd in Richmond that: "I’m positively hounded by cycle campaigners who just seem to be about one thing, and you’re either with them or against them." It sounds like George Bush and the war against terror. And it's not true, frankly. Cycle campaigners are a tricky lot. There are, I have to admit, some grumpy and rather strongly-opinionated folk in the cycle campaigning community. I've argued with plenty of them. Opinionated and grumpy, they may be. But they are also, as a rule, passionate, knowledgable and articulate. And they don't take kindly to people who tell them only half truths. And what's more, pretty much anyone who has been on a bike in London is a 'cycle campaigner'. They have to be. Because they know all too well what it's like to be threatened by proper danger as they get about the place on a bike. So I don't really understand why Zac Goldsmith told an audience in Richmond earlier today that 'you're either with [cycle campaigners] or your against them'. If you have time, have a read of the very fair summary of that meeting by Tim Lennon. 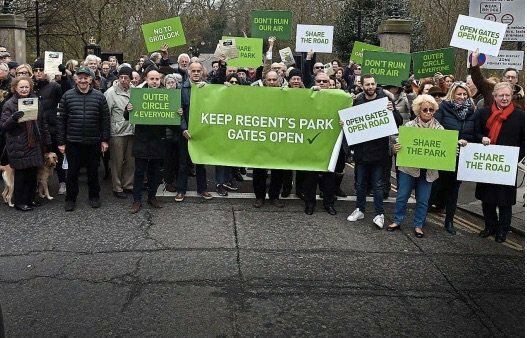 Earlier this week, TfL announced that a whopping 6,400 people had responded to its consultation to build a cycle highway via Regents Park to Swiss Cottage. Two-thirds of those people supported the cycle highway. There has been considerable local opposition, however, whipped up by someone who goes under no name on twitter. 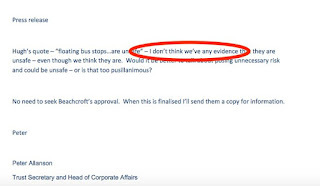 In order to get names on a signature (4,000, I believe), the campaign has presented 'facts' about the cycle highway that have been less than entirely honest. Yet Zac Goldsmith has said the cycle highway here is not something he "consider[s] a fait accompli". He says that "the question is not if we accommodate cycling and make it safer, the question is how". 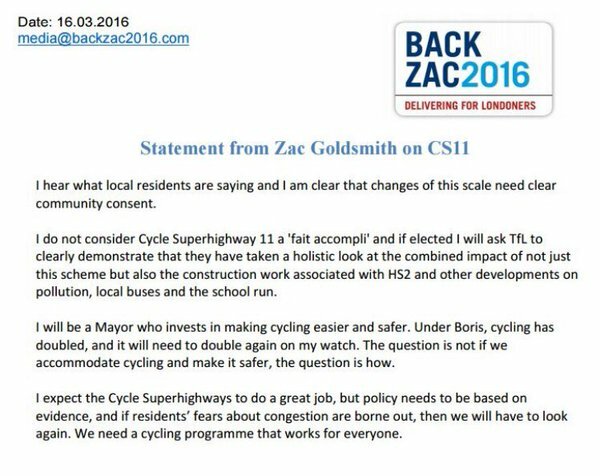 Well, I would like to know how Zac proposes to make cycling safer in London. Will it mean helmets and more training? Or will it mean safe, proven, infrastructure for cycling? 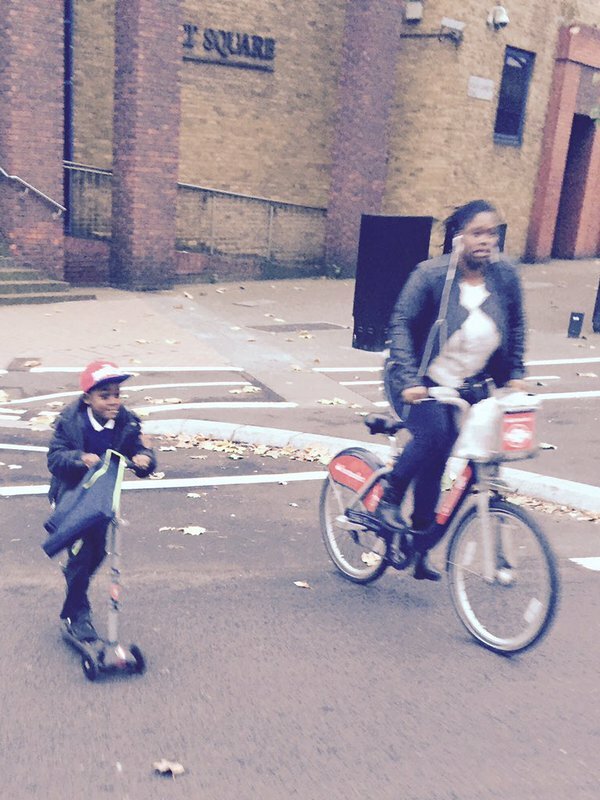 The early signs are that London's very new cycle infrastructure is working. Last week, Boris Johnson published a report written by his cycling commissioner, Andrew Gilligan, which showed just how well its working. The report is pretty clear - the number of people cycling is way up on these routes. Congestion has not increased for other road users. Does Zac mean he'll promise more of this? More segregated infrastructure on main roads? More roads made quieter for locals as well as for people who want to get about on foot or on a bike? It's really not clear. He has already said that he hopes the cycle highways work but 'If the evidence showed that they didn't work, you'd have no choice but to rip them up.' 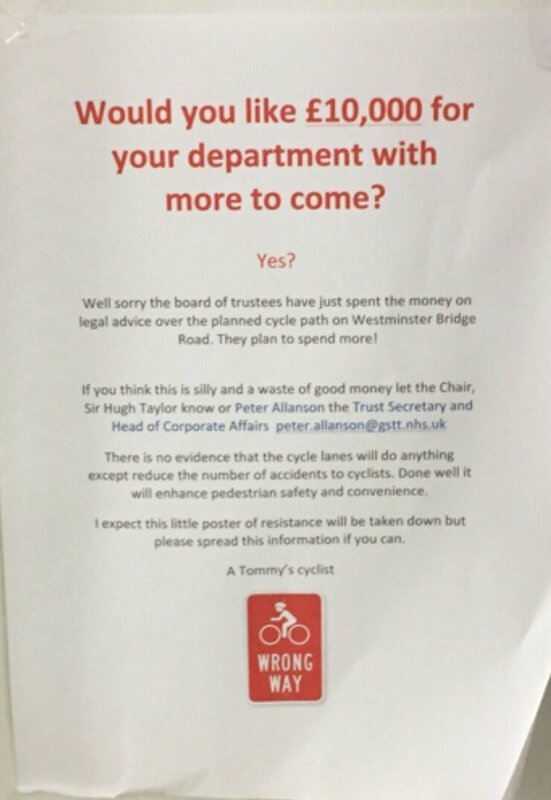 Does that mean that if people stand around with posters saying the cycle highways 'don't work' that he'll rip them up? Zac's cycling manifesto was published today. And the bulk of it seems to be about extending cycle hire. At one point he talks about cycle highways and quietways. He says he'll "protect TfL's investment budget". He very specifically does NOT say he will protect the hard-fought for 10 year cycling budget (of which we have only seen the first year's investment). Maybe Zac Goldsmith reckons he can win London by attacking cycling. But the thing is, all those cycling campaigners, yes, they are grumpy. But they are passionate. And I reckon they can swing a lot of voters who might vote Zac. I am a swing voter when it comes to London politics. I want what's best for my city. As many of you know, I was hugely critical of Boris Johnson's 'cycling revolution' when it started. But Boris's team won me over because I felt they could deliver. And they have started to deliver. I am not, I think, a natural Sadiq Khan supporter. Yet, when the London elections come round in two months' time, my swing vote may swing that way. Zac Goldsmith is making it really hard for me to vote for him, unless he massively changes his tune on cycling and commits to proper continuation of the cycling investment plan. There's still time for Zac Goldsmith to win the cycling vote. But he needs to show he takes cycling seriously. He hasn't done that yet, I'm afraid. London Elections: I didn't expect to be thinking of voting for Sadiq. I'm still not sure if I will. But, unless Zac Goldsmith changes his tune on cycling (and on buses, to be honest), he's completely lost my attention. London votes in May on its new Mayor to replace Boris Johnson. Lots of people I know don't vote. I think that's a real shame. At the last Mayoral elections, cycling was a really hot issue. And there was no way that the Mayoral candidates could get away from the fact that people wanted safe space4cycling. 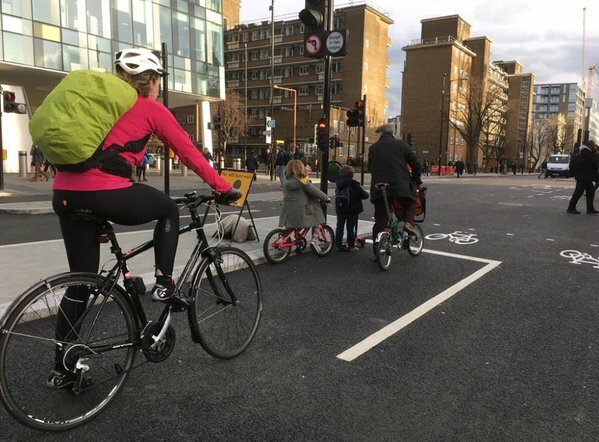 It was that pressure on the candidates that finally helped swing Boris Johnson towards (belatedly) building the proper, safe cycling facilities that are rolling out across London right now - whether those are cycle highways that take you through some of our city's scariest junctions or the quieter routes on local borough roads. In my view, if you care about your city, you should be voting. As I've said recently, I feel Boris really over-promised in his first Mayoralty. Lots of blue paint, lots of PR, lots of 'manning-up' and 'keeping your wits about you' as you darted through massive, scary road junctions. That all changed in his second term and we're seeing the results of that change in policy only now. 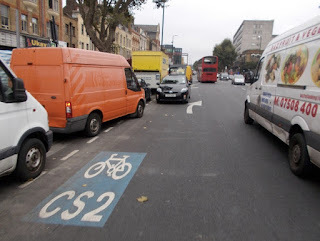 The Embankment cycle highway is only a few months off finishing; Oval junction is unrecognisably safer; CS2 now leads out east (although needs improving) and there are plans all over London (with the exception of Kensington & Chelsea who have adopted a do-nothing approach). To some extent, the heat has been taken out of the cycling debate. There's less antagonism at a policy level. But there's loads of antagonism in specific local hotspots around London. The residents of Swiss Cottage seem to be getting their pitchforks ready to kill off cycle highway 11 through Regents Park and there's loads of local anger up in Highbury as well. Lots of very noisy people want to drive, drive, drive. And be gone with the rest of you. It's really interesting seeing how the various Mayoral candidates are responding to this. First off, I'm going to mention Caroline Pidgeon (LibDem). I mention her first, as a lot of people seem to have written off the LibDems. But I'm going to stick my neck out here. Caroline has consistently backed cycling and she is the only London Assembly Member standing again this year who has really fought for cycling all the way through. Meanwhile, the Green's Sian Berry is making all the right noises as well. But the people I really find interesting in all this are Labour's Sadiq Khan and Conservative Zac Goldsmith. I don't think I'd cast myself as a natural Sadiq supporter. But his campaign is really grabbing my attention. I didn't originally think it would. In the past, Sadiq had appeared on the odd bicycle in photo shoots for Lambeth Cyclists but that was about it. More recently, he's been going gangbusters to woo the cycling vote. 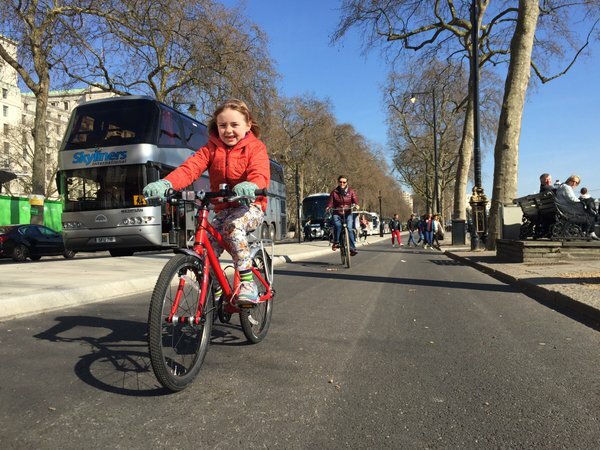 Sadiq's cycling plan commits to continue investing in the cycle highways, in safer junctions and in 20mph zones as well as the Quietway programme. He's appeared pedalling about with Chris Boardman and told him he wants to "make London a byword for cycling". Before he was selected as the Conservative candidate, Zac Goldsmith was full of promise. He told the Stop Killing Cyclists that more cycling was part of his plan to stop our city from "grinding to a standstill" and to reduce air pollution. He also promised to commit to cycling in his manifesto. or will he rip this up? He told LBC radio that he would let electric cars into the bus lanes and that within two to three years there would be "no point having bus lanes". I mean, seriously? If you're a bus user or a cyclist, this sounds like hell. And then he told LBC he would judge London's new cycle highways on the "impact on emergency services, the basis of traffic flow, on the basis of how many cyclists use them". 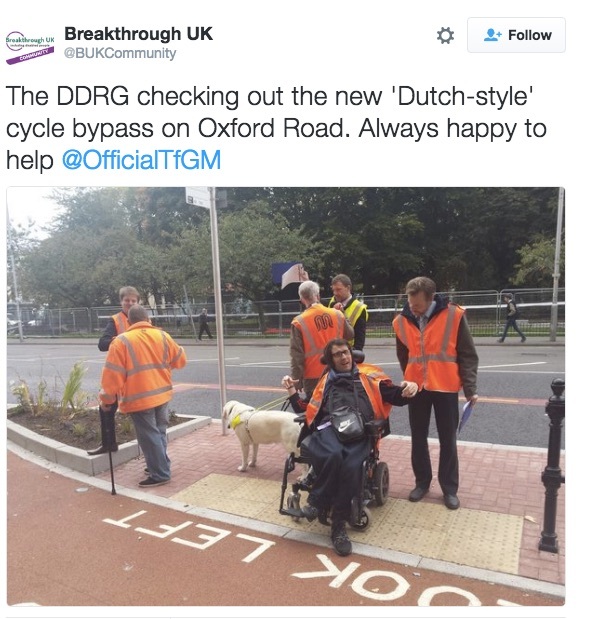 If the cycle highways are being used, he'd be obliged to promote them, he said. Well what on earth does that mean? Does that mean that if Mayor Zac decides motor traffic flow is more important, he'll rip up the cycle highways? How many cyclists does he want using the cycle highways before he decides to rip them up? Because what he said to LBC is "if the evidence showed that [the cycle highways] didn’t work then you’d have no choice but to rip them up." Maybe he's just being reasonable but it all feels very flip-flopping. It feels quite definitely bad, though, when you think that Zac has also refused to commit to more cycle highways, he's talked a lot about promoting more "Quietways" down back streets. I didn't expect to be thinking of voting for Sadiq. I'm still not sure if I will. But, unless Zac Goldsmith changes his tune on cycling (and on buses, to be honest), he's completely lost my attention. Here's a question for you. 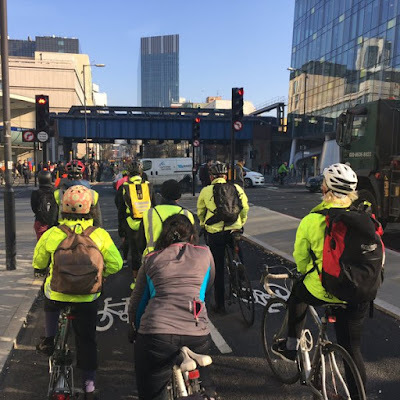 Have you used Cycle Super Highway 5 at Vauxhall - a one mile bi-directional cycle track that whizzes over Vauxhall Bridge and cuts through the middle of one of London's most dangerous junctions? I have. I am going out of my way each day to test it from different directions. And, with a few teething problems (cars often roll over the stop line on red, blocking the track), I think it is brilliant. It has turned areas I used to avoid into part of a route I will go out of my way to make use of. And I don't think I'm alone. Sure, at lunchtime it's not that busy. But at rush hour, at the end of the school day and at weekends, it's incredibly popular. 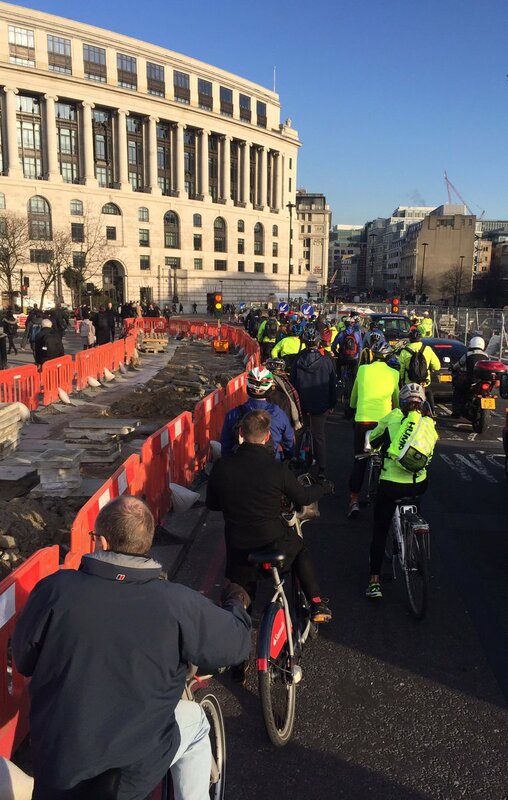 As the Mayor's press release stated, cycle traffic is up 29% on the route already. That's only three weeks after it opened. Nearly 40% of vehicles crossing the Bridge at rush hour are now bikes. What's more, the thing is already quite busy despite not even being properly finished. In two weeks' time, there will be a consultation on upgrading the bike tracks around the remainder of the Vauxhall gyratory so that east>west bike journeys are made easier and will line up with the new track on the Bridge. Once those links are built, the thing will be even busier. In that context, London's talk radio station, LBC, has decided to add some statistics of its own. According to LBC 'research' on the Bridge one lunchtime, 'cyclists' aren't using it and 'pedestrians' don't like it. Have a read of the transcript. It's pretty weak stuff. Still, it allows LBC's reporter to claim the Cycle Highway is a waste of time and money. This is a bit like sending a journalist to view the first section of the M25 before it went anywhere and concluding there was no point building the motorway. The facts of the LBC report are patently rubbish. But the report is very good at selling a simple message and clearly, plenty of people lap this sort of stuff up. Shock jock radio, 10 points, useful journalism, not really. Cycle Highway 5 in the evening. You might think that a deeply biased radio show on LBC doesn't really matter. And to some extent, it really doesn't. However, what does matter is that the general hum of noise against cycling is mounting. Love him or hate him, Boris Johnson has come on a long journey with regard cycling. I was fiercely critical of the first cycle super highways. They were an expensive and dangerous fudge. But they laid the groundwork for the Mayor to eventually get his spade out and do the things properly. We are only just starting to see the results of those new cycle highways but the Mayor will have left office before his flagship East-West cycle highway opens along the Embankment. 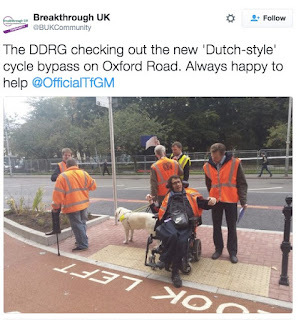 This puts the Cycle Highways in a really risky position. 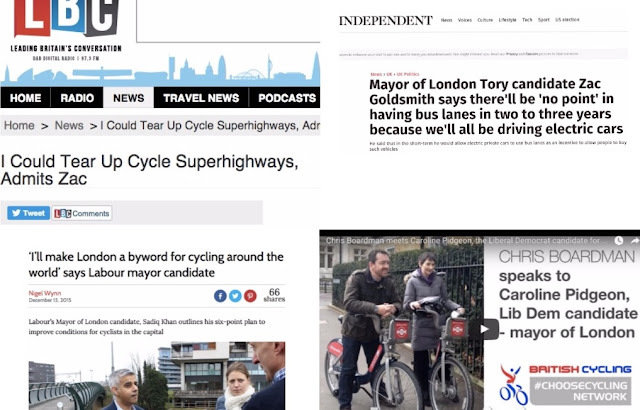 I wrote earlier this week about the Labour and Conservative Mayoral candidates - there's no obvious sign that the two candidates are in love with the Cycle Highways. As the Green Party peer Jenny Jones (who has been an absolute rock on things cycling-related for many years) said: 'Boris's commitment to cycling has "made [her] respect him for the first time ever"'. Love him or loathe him, the man has delivered. He was villified by many in the cycling community at the last election (including by me, if I'm honest). But credit where credit is due. Boris has stood firm against the critics. I've seen first hand some of the pressure the Mayor came under from Canary Wharf Group and others. Like Jenny Jones, I have to say that I'm full of respect for him pushing this through and delivering. I only wish he could have applied himself with the same zeal to a host of other issues too (housing, youth issues, to name a few). Put Boris's cycling achievements in to the context of the next Mayoral campaign, though, and things start to look really worrying. Zac Goldsmith told LBC today that "[The cycle] campaign groups are quite hard to deal with". They're not really. For a supposedly 'green' candidate, it really wouldn't take much for Goldsmith to win the cycling vote. But perhaps Goldsmith thinks people who cycle aren't a significant voting block. Some news for him: Just like last time, Londoners on Bikes will be swinging into gear. At the last election, this pop-up campaign group mustered over 11,000 people to vote on cycling. Given Boris won the election by a hair's breadth, that's not a mean number. 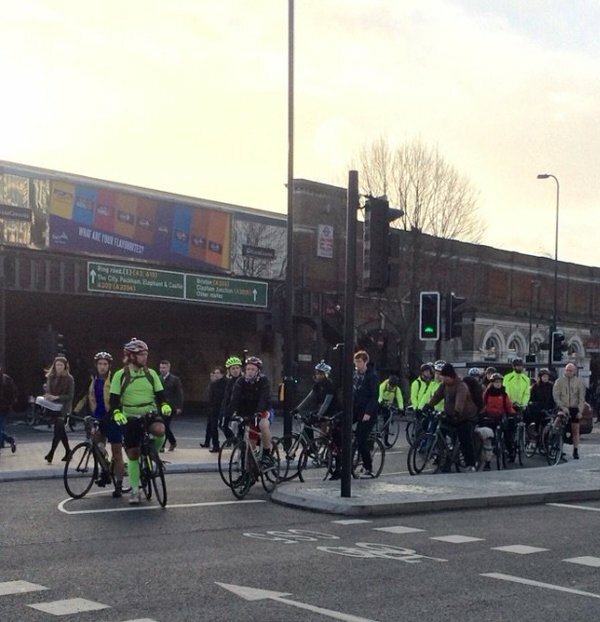 There are more of us now and I expect the Londoners on Bikes campaign to deliver even bigger numbers. Can I suggest that people start to follow Londoners on Bikes on Facebook or Twitter and all will become clear over the coming weeks.